Last fall at Scrap Arts we had a contest. We were given an empty Cricut Cartridge box to see what we could do with it. This is what I did with mine. All the entries were different and beautiful. 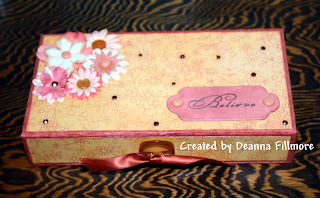 I covered this one completely with Mulberry paper and then decorated it with flowers, buttons, brads, rhinestones etc. The Believe, Dream, Love stamps are from Crafty Secrets. 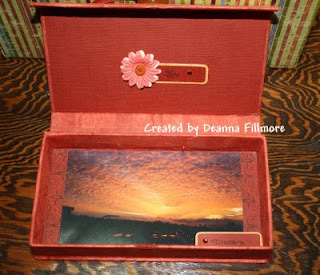 The picture inside is one I took from my balcony of sunrise one morning many years ago.